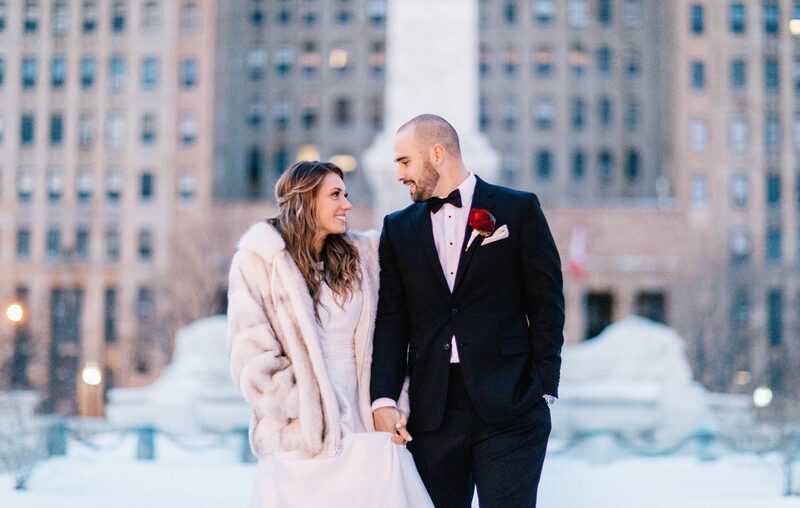 Erin Kelly and Parker Bean didn’t set out to have a large, grand hotel wedding. They envisioned a more rustic affair in the country, surrounded by lush landscape and a big, beautiful barn. But when the invite list began creeping toward 800, Erin came to terms with the fact that her original vision might not quite work out. It’s no secret that faith is central to the lives of the Kelly family. The power of prayer has been extolled by the family for many years, but especially recently as Jim continues to battle cancer. Their strong faith was reflected during many special wedding moments. Before the ceremony, six women formed a prayer circle over Erin. Her mother Jill explained that amidst the wedding chaos and excitement, the hair and makeup and hubbub, it gave them all a moment to reflect and pray about the gravity of what was about to happen—that Erin was committing, before God, to walk the rest of her days on earth with Parker. The women were all important in a special way, and most have known Erin her whole life. They included her mother, Jill; Erin’s grandmother; her kindergarten teacher; Jill’s longtime friend (and Erin’s godmother) who was with Jill when she found out she was pregnant; their good friend and wellness coach; and a former neighbor and mentor. In lieu of a “first look,” Erin joined a blindfolded Parker in a room adjacent to the Chapel to share a moment of prayer alone before the ceremony began. The father-daughter dance was especially poignant at Erin’s wedding. The two danced to Tim McGraw’s “My Little Girl,” a song that first gained significance during Erin’s purity ceremony at the age of 13. In that ceremony, explained Jill, Jim placed a purity ring on Erin’s finger, and Erin pledged to remain chaste until her wedding night. Erin kept her pledge, and the moment came full circle when, as a wedding gift, Erin presented the ring to her husband—intending that he give it to their own daughter one day. When Erin first got engaged, her mother sought out a prayer book that would help them both prepare for the occasion of marriage. She couldn’t find one—so she and Erin set out to write their own. With prayers taken from their own journals, plus tips and challenges to help frame the occasion and the commitment behind it, “Prayer and Planning for the Big Day” comes out December 11, 2018.